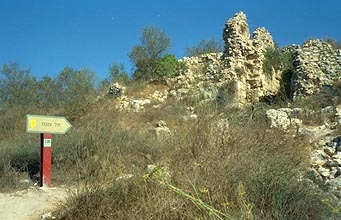 Tzuba is an old place name; the hill overlooking the kibbutz has been settled since at least First Temple times. 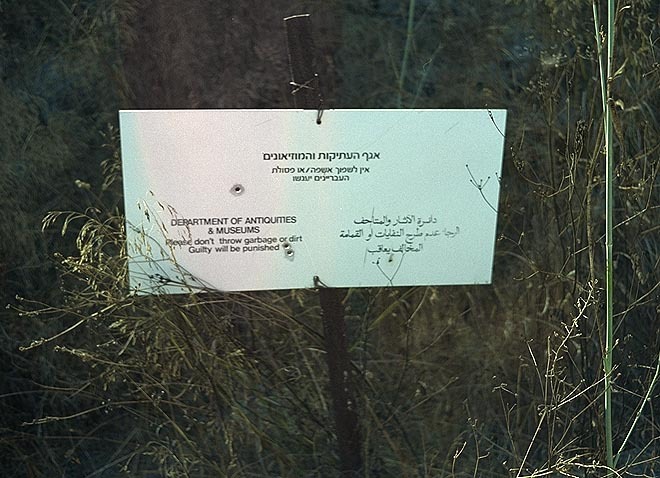 When you go up on the tel, you can find remnants of every civilization that's been in the land from then until the British Mandate: Ancient Israelis, Romans, Greeks, Crusaders, the Byzantines, Ottomans, Arabs. My visit in 1998 was the first time I'd ever seen the ruins signposted--it used to be you'd just tromp around up there figuring out whatever it was you were looking at. 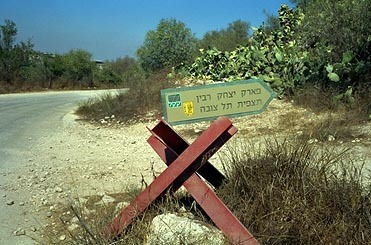 But the site has been absorbed into the Yitzhak Rabin Park, a ring of trails and historic sites through the vicinity. 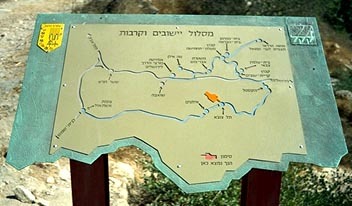 A map of the Yitzhak Rabin Park. The orange hand points at Tzuba. With all the new signs, modern Israel has officially left its mark on the mound. 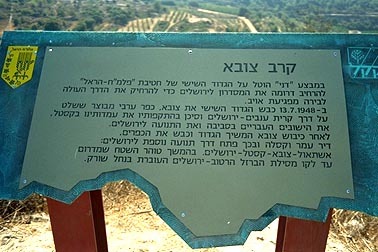 In Operation "Danny" it fell to the 6th Regiment of the Har-El Palmach Brigade to open the southern corridor to Jerusalem, in order to lift the enemy siege on the road up to the citadel. On July 13, 1948, the 6th Regiment climbed Tzuba, the fourth fortified village that protected the road from Qiryat-Anavim to Jerusalem, which controlled Qastel, the Jews in the vicinity, and movement to Jerusalem. After the conquest of Tzuba, the regiment went on to subdue the villages Dir Amar and Qasleh, and thus opened the road and added traffic to Jerusalem: Ashtaol-Tzuba-Qastel-Jerusalem. Some of the new signs are pretty cool. This one, for example, tells you what you're seeing as you cast your eyes along the horizon. Note the green and white angled marking on the rock under the sign. 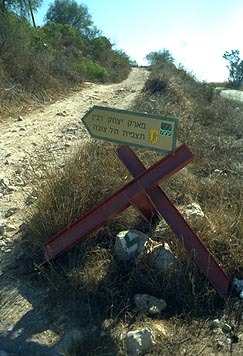 This is a characteristic way of marking trails all over Israel. Where the trail forks, a rock nearby will have a mark showing which way to take, or when a trail takes a sudden turn you might not notice, someone has painted a corner on a rock to show you where the trail goes. Of course, when a big formal sign gets put in place, you no longer need the markings on the rocks. But it's nice to be able to walk through an area uninterrupted by signposts and placards and still not get lost.